Feeling unsafe and awkward to ask strangers to help restart your vehicle? 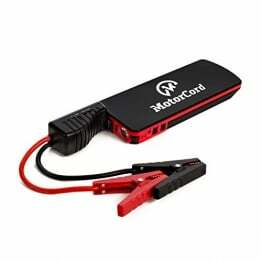 With Suaoki Car Jump Starter, boosting your car is safe, independent and time efficient. With 18000mAh battery capacity, your vehicle can start about 22 times. Just connect your vehicle to it and you are good to go. 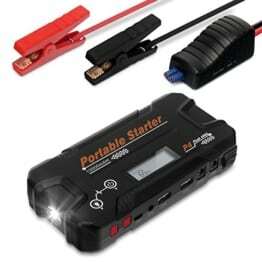 Well-equipped Jump Start Pack Suaoki Car Jump Starter offers 3-in-one solution in a portable, lightweight, and drop-resistant packaging to not only jump start your car, but also to serve as a power hub for your digital devices as well as emergency lighting source for rescue. Exclusive TIR-C Technology Suaoki charging family adopts an exclusive TIR-C technology, supporting target intelligent recognition of multiple devices and adaption to specific recharge rate to turbo-boost the charging process in safer constant current. USB Port: Dual USB Output Charging Time:around 4.5 hours.